Inspired by the ocean and seamlessly blending natural beauty and timeless luxury, Cunard announces the launch of its brand new holistic spa concept, Mareel. Co-created by Cunard and wellness trailblazer Canyon Ranch, Mareel Wellness & Beauty will launch exclusively on board the newly refurbished Queen Elizabeth this December, closely followed by Queen Victoria later in the month and on board Queen Mary 2 from November 2020. The word ‘Mareel’ is from old Norse language meaning ‘phosphorescence of the ocean’. This description of glowing light from the sea perfectly reflects our new ocean inspired wellness and beauty experiences that will leave guests feeling radiant, from the inside out. While Cunard sets the standard in maritime luxury, the spa and wellness treatments and expertise will be offered in partnership with Canyon Ranch, with a brand new and extended spa treatment menu featuring mineral-rich seawater and marine based experiences to transform and heal. Luxury products used within the new Mareel spa have all been selected to offer the very best and meet socially responsible production techniques, with organic treatments featuring ingredients that are sustainably harvested, wild-picked, biodynamic and toxin-free. The signature treatment of the Mareel spa is ‘Ocean Discovery’, offering the option to combine up to five treatments, or select individual 30 minute treatments if preferred. Using luxurious marine based products from VOYA which are sustainably harvested from Western Ireland, Ocean Discovery aims to leave guests feeling revitalised and illuminated from the glow of the ocean. Extending the offering of Mareel beyond the spa space, enhanced wellness experiences will also be offered across the ship’s daily activity programme including stretch and meditation films on stateroom TVs every morning, wellness seminars, activities on deck such as dance and open air yoga. The new Mareel Wellness & Beauty experience is just one offering following a refurbishment of Queen Elizabeth during a two week period in dry dock in Brest, France. 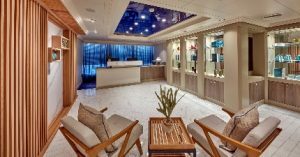 In addition to the new Mareel spa, many of the guest public areas have been updated and all Grill Suites and Britannia Staterooms have new carpets and soft furnishings. The Royal Court Theatre has had a complete technical overhaul and several public rooms, bars and lounges have also been refitted with new carpets. Outside on deck there is new furniture and the aft sun deck has a new layout. Finally a fresh shopping experience has been created in The Royal Arcade. Angus Struthers, VP Marketing Cunard, commented: “We are delighted to share news of Mareel Wellness & Beauty, Cunard’s first ever own spa concept. Wellbeing is key to life, and feeling relaxed in mind and body is an important part of any holiday, and we are thrilled to offer such a luxurious spa at sea for our guests”. 2019 is an important year for Queen Elizabeth. 3 January will see her set sail from Southampton to Australia via Cape Town, South Africa. She will be based in Australia until 30 March 2019, then depart for Tokyo, Japan for two voyages exploring the cultural delights of the islands. On 5 May 2019 she will start a transpacific voyage to relocate to Alaska for a maiden season until 30 June 2019. Queen Elizabeth will then head back to Southampton via the Panama Canal.